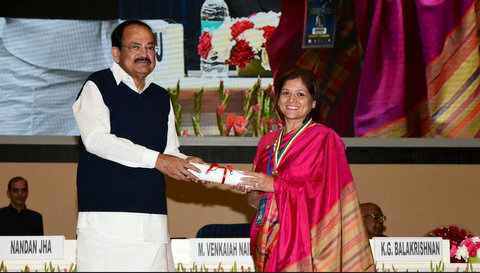 Nagpur based social activist and wedding planner – Manisha Malu Verma – recently received ‘Champion of Change’ award at the hands of Vice President of India M Venkaiah Naidu. Verma was conferred upon the award for ushering in change in the district under the programme ‘Transformation of Aspirational District.’ The programme is a brainchild of the NITI Aayog, which aims to quickly and effectively bring about transformational changes in the chosen 115 districts of India. Manisha received the award for her contribution in the field of child education, hygiene, cleanliness and upliftment of the less fortunate. The award selection jury was led by Former Chief Justice Shri KG Balakrishnan and comprised former Supreme Court Judge, Gyan Sudha Mishra, former Chief Election Commissioner of India, Dr SY Quraishi, Padma Vibhushan Sonal Mansingh, former CBI director Anil Kumar Sinha, Chairman of Central Board of Film Certification, Pahlaj Nihalani, Additional Secretary NITI Aayog Yaduvendra Mathur and President of Aditya Birla Group Amit Bajaj. Around 35 prominent citizens including senior political leaders, bureaucrats and social activists from around the country were selected for the award. The award ceremony took place at Vigyan Bhavan, New Delhi on 26th December 2018. Other dignitaries present during the ceremony were- filmmaker Subhash Ghai, Bollywood actor Govinda, CEO of Power Corridors Nandan Jha, Dr Ved Prakash Vedik, etc. Other prominent awardees included Chief Minister of Manipur N Biren Singh, Union Minister of State for Tribal Affairs Sudarshan Bhaga, Member of Parliament Nishikant Dubey, etc., were many other known personalities from the different walks of life and region.